What is it that shows true masculinity? Is it the way one walks? Perhaps it’s the way a man talks? Or is it the way he talks? Well, I believe it’s a combination of a lot of things, but the top of my list is what a man wears. His clothes and accessories speak volumes about his lifestyle. And Casio discovered this little secret long ago and started making the G-Shock series of watches. These watches are an icon of strength, of durability, of persistence, of resilience. They ooze masculinity. They project a rugged appeal. And all this rubs off on the man wearing it. A man who can’t stop and won’t stop be it rain or shine. A man who knows no bounds. So, representing the G-Shock family with perfection is the GA 100 Military Series Watch. It’s a bold watch that is sophisticated yet rugged. It’s clothed in black resin and, just like its Casio Siblings, it doesn’t disappoint. Ladies and Gentlemen, here’s the Casio G Shock GA 100 1A1 Watch Review. It’s only natural that I start with this world-class feature. 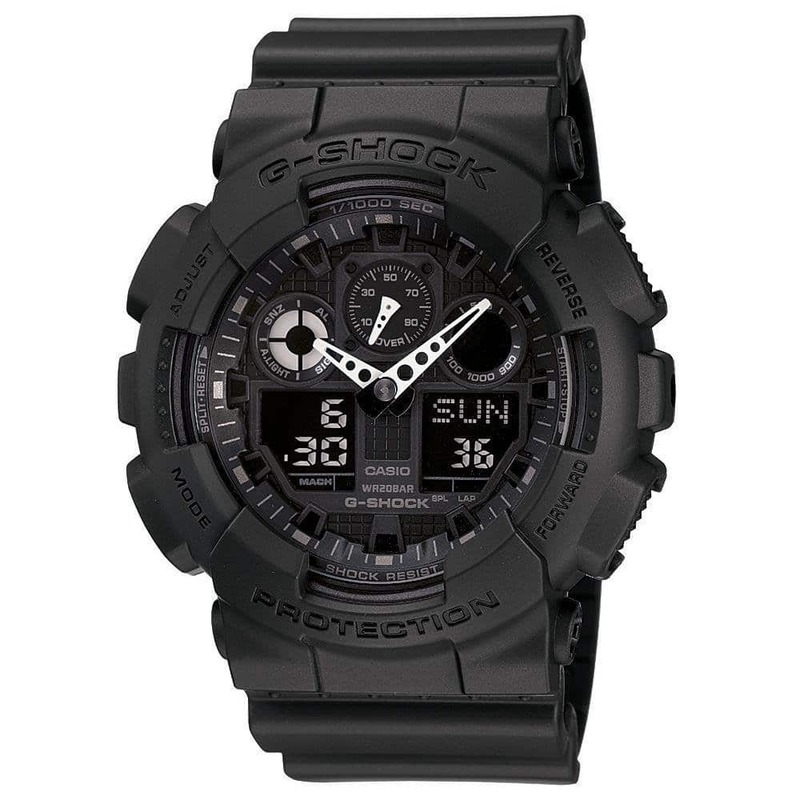 The G-Shock protection is Casio’s trademark creation that’s endowed to watches and make them the epitome of toughness. With the G-Shock mark, you know the watch can resist high impact, mechanical shock and any other hardships that life might throw at it. G-Shocks are resilient, and the Casio G Shock GA 100 1A1 carries that badge with honor. Wherever you go, the watch remains snugly wrapped around your wrist and doesn’t flinch no matter the conditions. You have no need to disturb about its state at the end of an outdoor expedition. The G-Shock wasn’t enough for Casio. They also added water resistance to the GA 100 military watch. And it isn’t just your normal water resistance; this one allows the watch to go as deep as 200 meters. So if you are caught out in the storm, that’s nothing for this watch, it loves rain. If you decide to take a dunk in the water, just keep the watch on your wrist. It will survive the swim. So you’re one of those who can’t decide which is better between analog and digital. And this influences your decision on buying a watch. Now, instead of buying more than one watch why not just buy the Casio G Shock GA 100 1A1 Watch? Why do you ask? Because it has both analog and digital. This watch has white analog hands that accurately move by the second and a digital watch as well. If you can’t decide, then have both in one watch and never fail to know the correct time. You travel a lot and don’t like to reset your watch to the correct time continuously. With the GA 100, you don’t have to do that. Casio gave this watch a capability to tell the time in 29 different time zones. What you get is the time in 48 cities around the world right on your wrist. The display can be swapped between the time in your home city and the world time. Moving around in the dark? 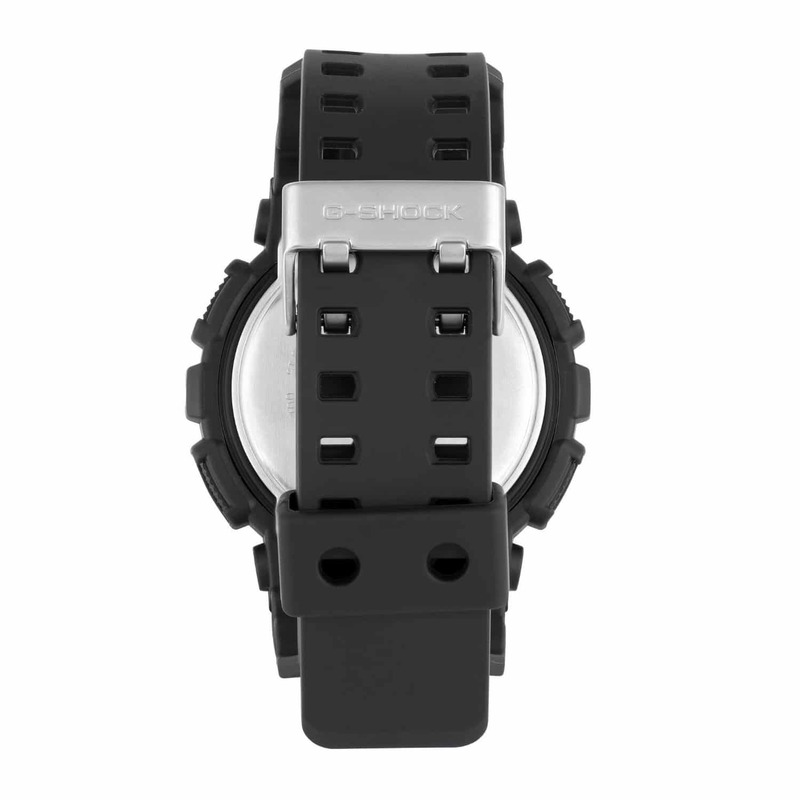 Not to worry because the Casio G Shock GA 100 1A1 Watch also comes equipped with a handy auto LED light. This light brightly illuminates the face of the watch, revealing what time it is. You don’t need a separate light source with this one. The auto light allows you to specify the duration you want the illumination to remain on when you press it. This Casio Watch has the G-Shock protection which makes it highly resistant to mechanical shock. The water resistance is up to a depth of 200 meters making it perfect for water activities. Casio G SHOCK GA 100 1A1 Watch has both analog and digital time. With the auto LED, you can specify the duration you want the light to illuminate the watch face on the press. The watch has world time functionality that lets you know the time in 48 cities within 29 different time zones. 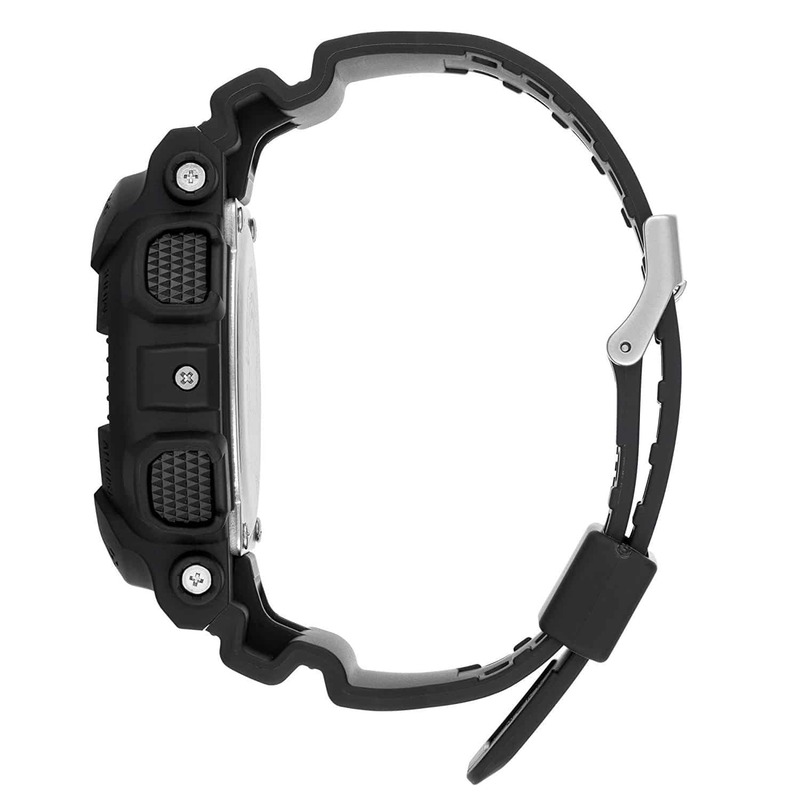 The strong resin material is impervious to dust and adds the durability of the watch. The white analog hands are easy to read. Unfortunately, Casio did not include solar power capability in this watch. The minute hand blocks the digital time for about 10 minutes every hour as it moves past it. Q: Does the Casio GA 100 have Atomic Time Keeping? A: No, it doesn’t have that feature, I’m afraid. Q: Is there a calendar function? A: Yes. The watch has a full auto calendar that’s preprogrammed until the year 2099. It’s no doubt that Casio are masters in making durable and functional watches and this watch is no exception. The watch provides the wearer a feeling of confidence both in himself and in the watch. The durable nature both from the G-Shock and the water resistance keeps you from limiting yourself. Be certain that this watch won’t complain after a few months of use. You’ll be using it for years and years to come. Yes, there isn’t solar capability, but the battery power can last up to two years. So, to end this Casio G Shock GA 100 1A1 Watch Review, we give the watch two thumbs up.